The Environmental Protection Agency has issued their first official fuel economy figures for the 2014 Mazda3 hatchback and the great looking compact will offer 40 mpg on the highway, 33mpg combined and either 29 or 30mpg around town depending on the transmission chosen – making it more efficient than the current Mazda3 5-door in every category while also being a touch more powerful. The 2014 Mazda3 5-door hatchback was introduced online rather than at a major auto show but that hasn’t had much negative impact in terms of interest around the sporty new compact Mazda. The Mazda6-like exterior design has been heavily applauded since being introduced and the news of some added power helped to contribute to the current level of buzz around the 2014 Mazda3 but the fact that it is also more efficient in every way comes as the most impressive attribute thus far. 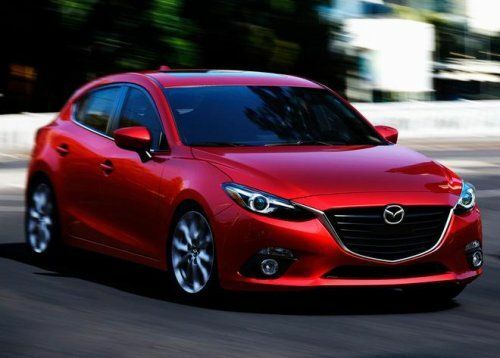 Click here for a closer look at the styling of the 2014 Mazda3. So far, we only have the official EPA fuel economy figures for the 2014 Mazda3 5-door when fitted with the SkyActiv-G 2.0-liter engine and either a 6 speed automatic or manual transmission but with these first figures, Mazda has achieved their projected fuel economy numbers. More importantly, the 2013 Mazda3 has reached the oh-so-important 40mpg barrier. Right now, the most efficient 2014 Mazda3 hatchback is fitted with the 6 speed automatic transmission and this configuration offers 40 miles per gallon on the highway, 30 in the city and an average number of 33mpg. Should you opt for the 6 speed manual transmission (which would most certainly be my choice), you still get 40mpg on the highway and 33 combined but you do lose 1mpg around town – dropping to “just” 29 miles per gallon. For comparison, the 2013 Mazda3 hatchback with the less-powerful 2.0L option and an automatic transmission offers 39mpg on the highway, 28 in the city and 32 combined while the same vehicle with a manual transmission offers 38 on the highway, 27 in the city and 31 combined. In other words, the 2014 Mazda3 5-door with the Skyactiv 2.0L engine is more efficient than the current model in every way. More importantly, the 2014 Mazda3 5-door is officially one of the most efficient cars in the C segment compact class in which it competes. Only the Chevrolet Cruze Eco offers better highway fuel economy (42 with a manual transmission) but that sedan offers the same 33mpg combined and 1mpg less in the city. The Dodge Dart Aero with the 6 speed manual transmission offers an advantage of 41mpg on the highway but just 32 combined and 28 in the city. The Ford Focus SFE sedan offers 40 on the highway and 33 combined but “only” 28 around town with an automatic transmission. Other non-hybrid vehicles in the segment including the Hyundai Elantra, the Toyota Corolla, the Honda Civic and the Kia Forte Eco all fall well short of the Mazda3. The EPA hasn’t touched on the rest of the 2014 Mazda3 fuel economy figures but Mazda has offered their expected fuel economy numbers for the rest of the compact Mazda3 lineup. These are not official numbers but we should keep in mind that the EPA figures for the Mazda3 5-door with the 2.0L engine are identical to the automaker’s projected numbers. Should that trend continue with the other configurations – the 2014 Mazda3 will be one of the most fuel efficient models available in the US. The Japanese automaker expects that the 2014 Mazda3 4-door sedan with the 2.0L Skyactiv-G engine and the 6 speed automatic transmission will be the most efficient model in the range with projected figures of 41 miles per gallon on the highway and 30 around town. That same body and engine with a manual transmission could see the city MPGs drop to 29. Those 2014 Mazda3 buyers who are less concerned with fuel economy than power will be able to opt for the 2.5L Skyactiv-G engine that will offer 184 hp and 185 lb-ft of torque. In the hatchback, this powerful engine is projected to reach 37mpg on the highway and 28 around town with the 6 speed auto transmission while the more powerful version mated to the i-Eloop assist system could see 39 on the highway and 29 around town. In the sedan, the 2.5L engine could achieve 39mpg on the highway and 28 in the city while the i-Eloop equipped sedans could hit 40 on the highway and 29 around town – which is mighty impressive for a compact sedan with 184 horsepower and 185lb-ft of torque.